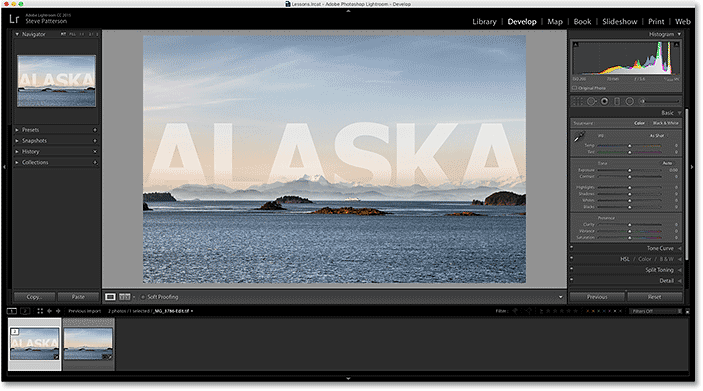 Learn how to easily move raw image files from Adobe Lightroom into Photoshop for further editing. Then how to return the edited version back to Lightroom when you’re done! 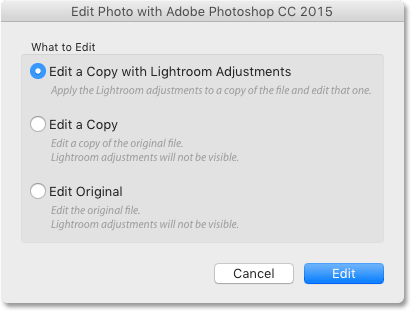 Specifically, we’ll be looking at Lightroom CC and Photoshop CC and how to move an image seamlessly between them. 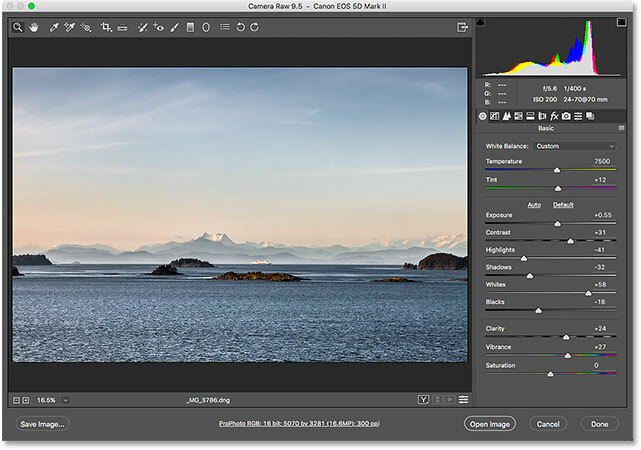 Both Lightroom and Photoshop have their place in a good image editing workflow. Rather than competing with each other for the title of "World's Best Image Editor", each program has its own unique strengths that balance out the other's weaknesses. Lightroom's non-destructive nature and intuitive controls are great for making initial global edits to the image; that is, improvements to the photo as a whole. With Lightroom, we can easily fix the exposure and white balance, enhance contrast and color saturation, add some initial sharpening, and more. Yet for all its power, Lightroom is not a pixel editor. It works by storing instructions on how to improve and enhance the look of the image. 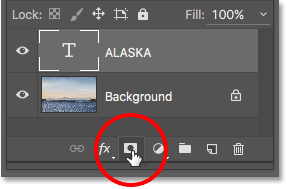 What we see on the screen in Lightroom is nothing more than a preview of what the image would look like if we were to apply those instructions to the image. The benefit to this type of workflow is that it's entirely non-destructive; no matter what we do, the original photo remains safe and unharmed. The downside, though, is that there's only so much we can do non-destructively. At some point, we usually need to start making changes to the actual pixels in the image itself. Lightroom can't do that. It's not a pixel editor, but Photoshop most definitely is! 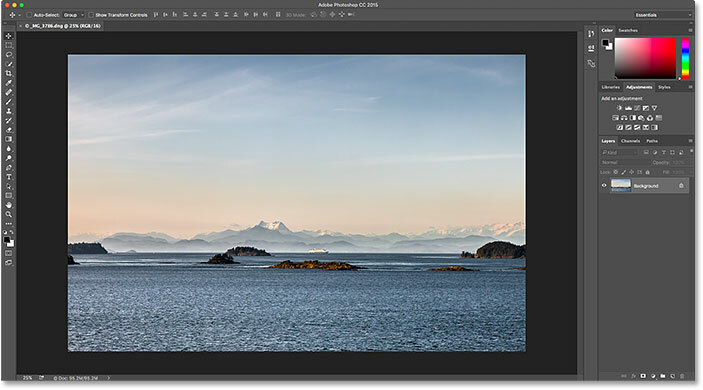 While there are ways to work non-destructively in Photoshop, its main strength is that it's a pixel editing powerhouse, making it great for local edits; that is, changes to a specific part of the photo. 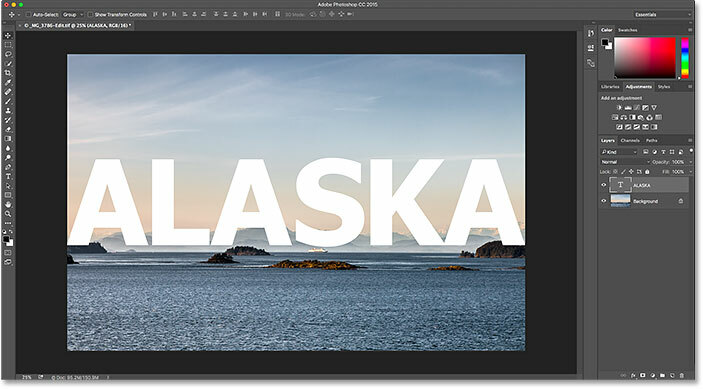 Photoshop has lots of features that are not available in Lightroom, like selection tools, layers and layer masks, blend modes, the ability to add text and graphics to our images, and much more. Photoshop also lets us work more creatively thanks to its many filters and its ability to composite multiple images together, something Lightroom simply can't do. A good Lightroom/Photoshop workflow means we start off in Lightroom completing as much of the initial, global work as possible. Once we've done all we can in Lightroom, we then pass the image over to Photoshop for more localized or creative adjustments. Yet while we start off in Lightroom, we also end in Lightroom. That's because, along with being an image editor, Lightroom also manages and organizes our images, keeping track not only of our editing instructions but also where each image is stored on our computer, any ratings or keywords we've applied, the copyright information for each image, and lots more. Lightroom stores all of this information in a database which it calls a catalog, and because Lightroom and Photoshop work so seamlessly together, Lightroom can automatically add the edited version of our image to its catalog once we save our work in Photoshop! At least, it can if we follow the right steps, and we'll be learning all about those steps throughout this tutorial. Lightroom was designed primarily as a raw image editor, but it can also work with non-raw files (JPEG, TIFF and PSD files). However, in this tutorial, we'll look specifically at raw files. There's a slight but important difference between moving raw and non-raw files from Lightroom to Photoshop, so we'll cover non-raw files in the next tutorial. This is lesson 8 of 10 in Chapter 2 - Opening Images into Photoshop. Let's get started! To keep us on track with the topic of this tutorial, I won't be covering Lightroom or Photoshop in any great detail here. Instead, I'll be skimming over certain things rather quickly (things that are not really important to the topic at hand) so we can focus our attention on how to move raw files between Lightroom and Photoshop. A raw file open in Lightroom's Develop module. The initial, global image enhancements. The three letter extension tells us which type of file we're working with. 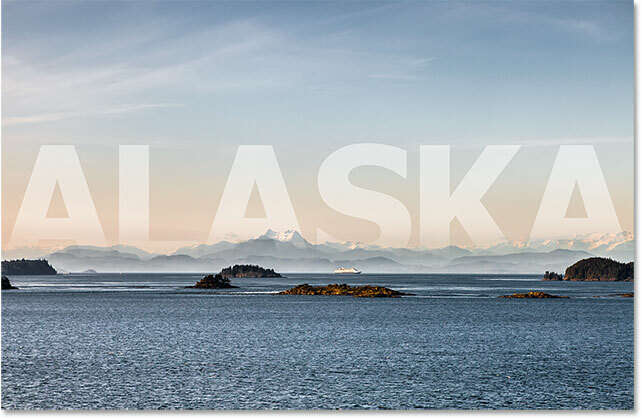 Let's say I've done all I can with my photo in Lightroom, and now I'd like to add some text to the image. 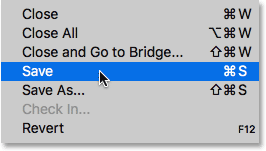 Lightroom doesn't have any features for adding text, but Photoshop does, so I'll need to move the raw file from Lightroom over to Photoshop. Going to Photo > Edit In > Edit in Adobe Photoshop. The same image has been moved from Lightroom over to Photoshop. What Happened To Camera Raw? If you've worked with Photoshop and raw files in the past, you may be wondering what just happened here. How was Photoshop able to open a raw file directly? The Adobe Camera Raw plugin normally appears when we try to open a raw file into Photoshop. And yet, when I passed my raw file from Lightroom over to Photoshop, the Camera Raw plugin did not appear. Instead, the image seemed to open directly into Photoshop. How was that possible when Photoshop can't open raw files? It's possible because Lightroom and Camera Raw use the exact same raw processing engine under the hood. What happens when we pass a raw file from Lightroom over to Photoshop is that Camera Raw secretly steps in behind the scenes, looks at the editing instructions we made in Lightroom, and then uses those same instructions to convert the image from a raw file into pixels. In other words, the raw file didn't really open directly into Photoshop. Camera Raw stepped in behind the scenes and converted it into a pixel-based image for us using the edits we made in Lightroom. 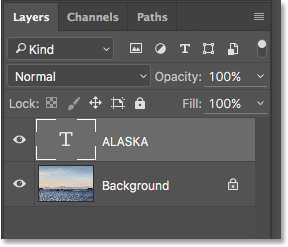 Selecting the Type Tool in Photoshop. Adding some text to the image in Photoshop. 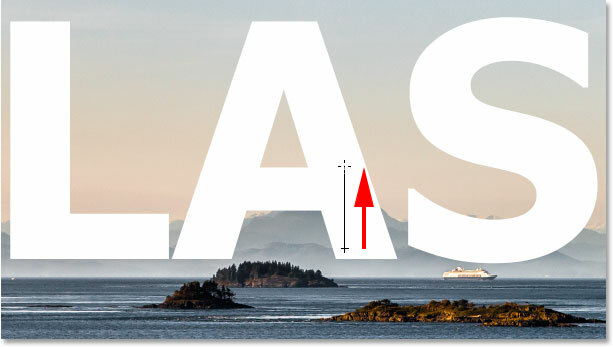 Resizing and moving the text with Free Transform in Photoshop. The image after adding the text. Let's say that I'm happy with the way it looks for now and I want to save what I've done. This next part is very important because I also want to make sure that Lightroom knows what I've done with the image. After all, both programs are working as a team. 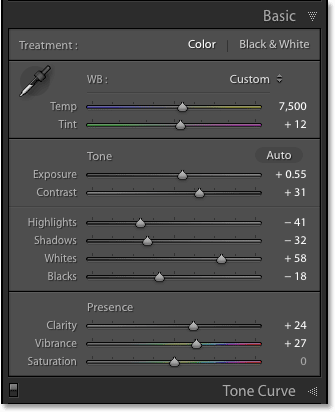 The Photoshop edits are now visible in Lightroom. However, while it looks like the same image, if we look down in my Filmstrip along the bottom of Lightroom, we see that I now actually have not one but two versions of the same image. Why are there two versions? When we pass a raw file from Lightroom over to Photoshop, Lightroom doesn't actually pass the original image. Instead, it makes a copy of the image and passes the copy over to Photoshop. Again, that's because Photoshop can't work with raw files directly so it needs a separate, pixel-based version to work on. 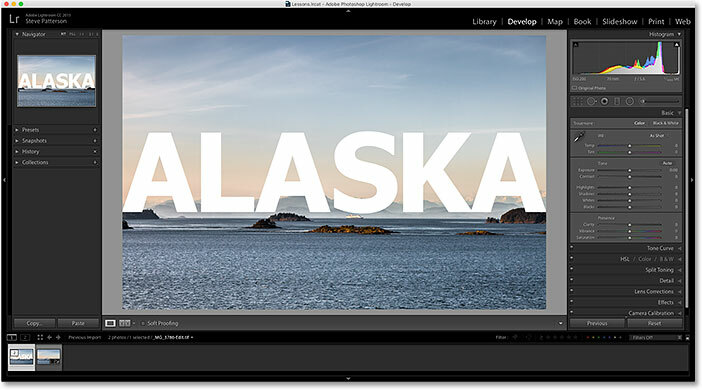 Lightroom's catalog now includes both the original image and the copy edited in Photoshop. The copy was automatically saved as a TIFF file with "-Edit" appended to the name. The Basic panel no longer shows the original raw file adjustments. 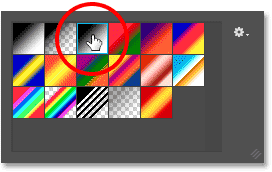 What if we need to make additional edits to the image in Photoshop? For example, let's say I want to blend my text in with the image using a layer mask. I can't do that in Lightroom so I'll need to re-open the image in Photoshop. Going again to Photo > Edit In > Edit in Adobe Photoshop. With non-raw files, Lightroom asks what it should send to Photoshop. 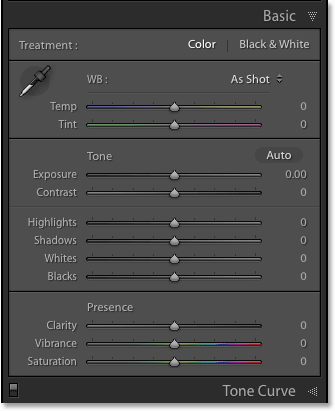 The first option, Edit a Copy with Lightroom Adjustments, is not what we want, at least not in this situation. 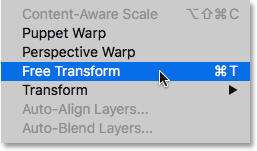 This option will make yet another copy of the image, which we don't need, and it will include any additional changes that we've made in Lightroom since the last time we worked on the image in Photoshop. I haven't made any additional Lightroom changes, so there's nothing here to include. But the main reason why this is not a good option when re-editing an image in Photoshop is that it has the unfortunate side effect of flattening the image and discarding your layers. In my case, my Type layer would be merged with the image itself, leaving my text completely uneditable. The Edit a Copy with Lightroom Adjustments option is useful in other situations, as we'll see in the next tutorial when we look at working with JPEG files in Lightroom. It's just not a good choice here. The second option, Edit a Copy, is at least a better choice, if not the best, because it won't flatten your image, which means you'll keep your Photoshop layers. However, it will still make another copy of the image that we really don't need. The best option for re-editing images in Photoshop is the third one, Edit Original. It won't make any unnecessary copies, letting you re-edit the same file, and it won't flatten your image, which means any layers you added previously in Photoshop will still be there. 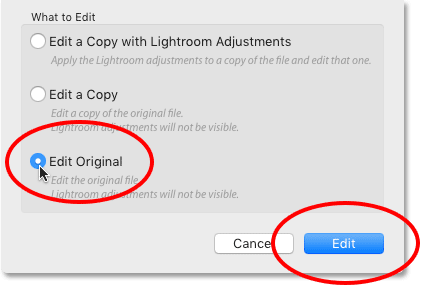 One important note, though, is that neither the Edit a Copy option nor the Edit Original option will pass along any additional changes you've made in Lightroom since the last time you worked on the image in Photoshop. This can cause a bit of confusion when the image appears in Photoshop since it will look like your most recent adjustments (if any) are missing. However, it's only temporary. 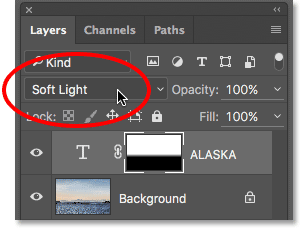 As soon as you save your work in Photoshop and return to Lightroom, your Lightroom adjustments will again be visible, along with any changes you made in Photoshop. Choosing "Edit Original", then clicking the Edit button. The previously-edited image re-opens in Photoshop. The name of the file matches the one in Lightroom. The Layers panel showing my previous layers still intact. Adding a layer mask to the Type layer. Choosing the Black to White gradient from the Gradient Picker. 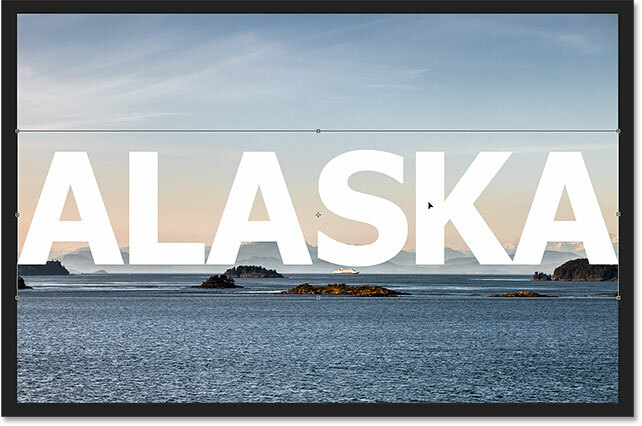 Dragging a black to white gradient on the layer mask from the bottom towards the center of the text. The effect after drawing the gradient on the layer mask. Changing the Type layer's blend mode to Soft Light. The final effect in Photoshop. Going again to File > Save. 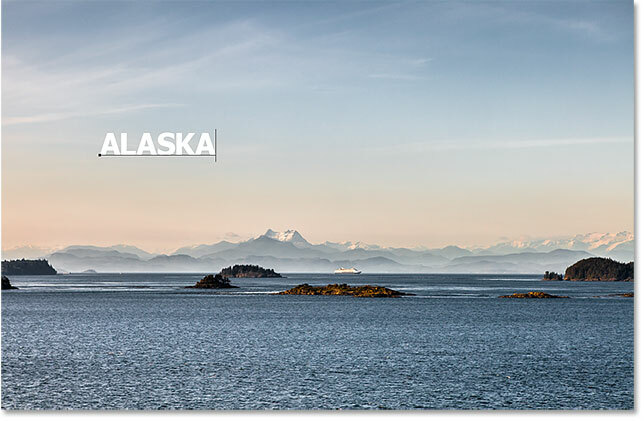 Lightroom's catalog is once again updated with the changes made in Photoshop. And there we have it! While Lightroom is primarily a raw image editor, it can also be used with more traditional JPEG files. In the next lesson in this chapter, we learn how to move JPEG files from Lightroom to Photoshop! For more chapters and for our latest tutorials, visit our Photoshop Basics section!